Mormons aren't supposed to gamble; Mitt got $10million from casino magnet Sheldon Adelson. Why doesn't some reporter ask Mitt about that? That was a tweet from TV provocateur Bill Maher about a week or so ago. Sheldon Adelson owns casinos. You could even say he is attracted to casinos, which is why he owns so many of them. But he does not attract casinos to himself in the way "chick magnet" Matthew McConaughey attracts women, for instance. That is because Sheldon Adelson is not a "casino magnet" but rather a "casino magnate." The primary pronunciation of magnate in most guides calls for a long a in the second syllable, but enough people of dubious breeding are pronouncing it exactly like magnet that that has become an established alternative utterance. This has obviously led to some confusion between the words, as evidenced by the faulty tweet of said TV provocateur. I'll never be able to trust the Internet again. Addendum: For an excerpt of the funniest writing you will ever read on magnets, see this. 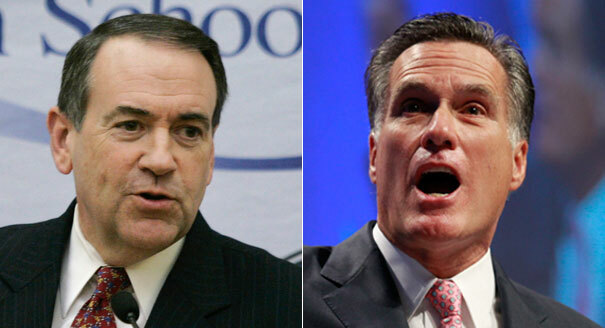 Mike Huckabee: "Madonna more likely to pick me than Mitt Romney"
What's this? The Huckster and the Mitt Man are fighting for the romantic favors of an aging pop tart? And Huckabee thinks he has the inside edge? That's the impression you could get from that HuffPo headline from earlier today. Sadly, the real story is nowhere near as awkwardly surreal. Huckabee was asked about the chances of his being selected as Mitten's running mate and he responded, "I think there is a greater likelihood that I'll be asked by Madonna to go on tour as her bass player." A weird reference for him to make, perhaps, but not as disturbingly weird as the headline seems to promise. This the kind of ambiguity that can arise when the word than mixes with people, and it can often be cleared up with the addition of a tiny verb. If that headline had an is at the end, there would have been much less opportunity for the reader to conjure an image of two middle-aged political blowhards doing a "the girl is mine" routine. Or take, for instance, the sentence: "I love wine more than my wife." That could be taken to mean that I love wine more than my wife does. Or it could mean that I love wine more than I love my wife. In my case, the first interpretation is an unremarkable declaration of fact. The latter is just speculation on my wife's part. How Do You Say "False Arrest" in Swedish? Last night we had dinner at Ikea (yeah, like you've never done it) and after a splendid repast of fish and discount cafeteria Cabernet, my micro-bladdered wife, Kim, had to (predictably) adjourn to the facilities. 2. There is no surer way of getting the hairy eyeball than by loitering outside the women's washroom with a camera trained on the door and discount Cabernet on your breath.